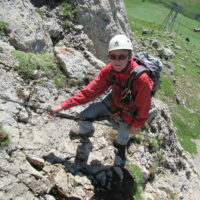 Although John has a great love of travel, walking and climbing mountains around the world, he moved to Leeds over 30 years ago and has a firmly rooted base in beautiful Wharfedale in Yorkshire. Having said that he is a member of the Fell and Rock Climbing Club in the Lakes and “compleating” the Munros has spent many splendid mountain days in Scotland. His first visit to the Dolomites was not until 1998 when he fell in love with the spectacular mountains, culture and Via Ferratas. John talked himself and Marion into jobs working with a fledgling Colletts Mountain Holidays spending two full summers in Arabba. In ticking off VF routes with a growing passion, he recognised the need for an up to date English language guidebook and also found that many routes existed which were not printed at all in English. A friendship with Graham and Meg Fletcher led to the guidebook writing project for Cicerone Press. Even though a lot of hard work was involved, the project was really rewarding; researching the routes and working with Graham was a shared labour of love with many enjoyable and exciting days in the Dolomites.